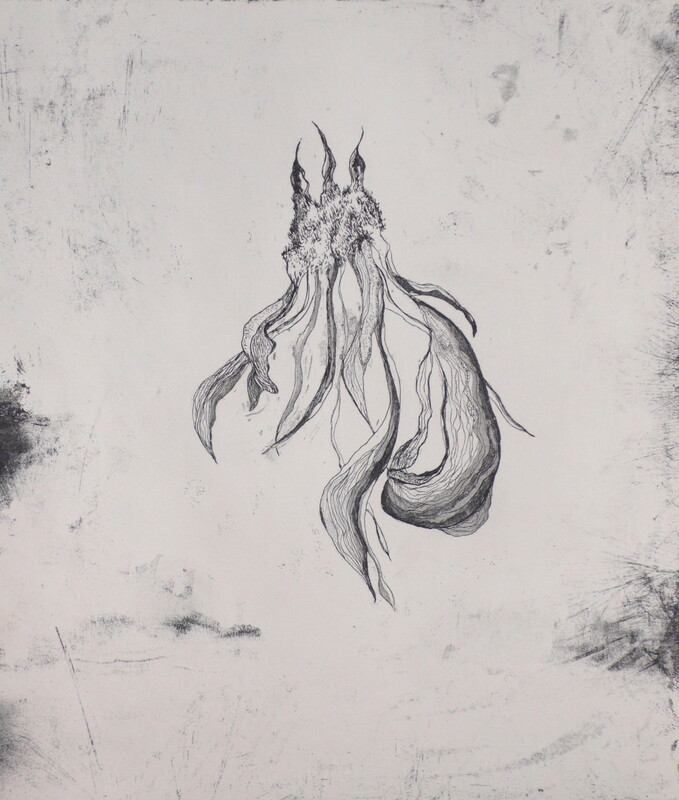 As a printmaker, it is etching on copper that has engaged me the most over the years. By encouraging foul biting on the copper plate, during the etching process, a dialogue is created between random surface impressions and my drawn lines. It is always exciting to clean the plate after this process and to see what emerges. What I like about this way of working is the element of engaging with the unknown, and allowing things to happen where I am not in complete control. However, if I feel that particular random marks don’t work for the image, the copper plate is worked into to remove them. I enjoy this physicality of working with the copper and the mixture between having to be both careful with the surface but also having to scrape away into the metal to remove unwanted marks. 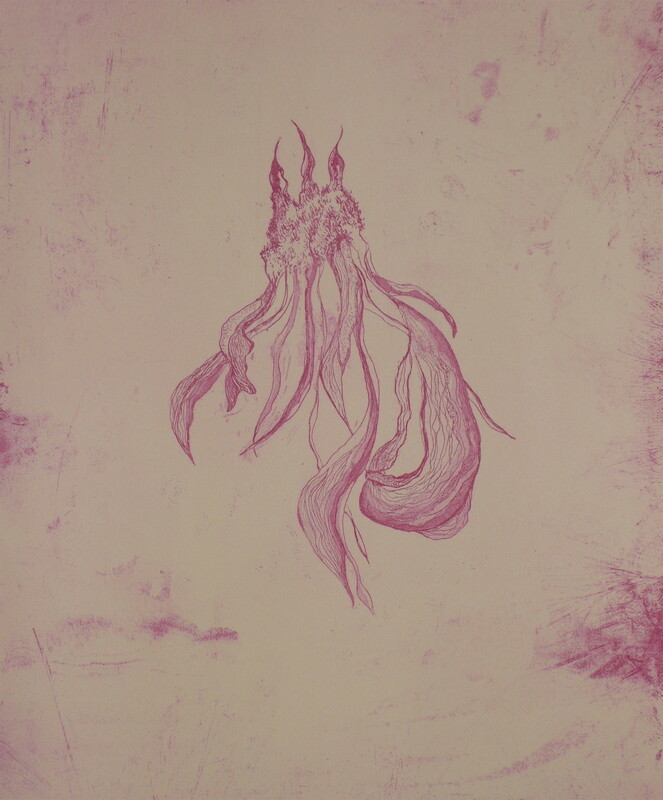 I usually apply several hard grounds to rework the image, and sometimes an aquatint. With the plates being left in the ferric chloride for a long time, it creates foul biting but also deeply etched lines so that the surface of the print almost becomes tactile and alludes to the molecular. With this I hope to create a sense of looking under a magnifying glass with the surfaces being evocative of the changing textures of ‘living’ surfaces such as plant physiology, growth and decay. The surface of the print is sometimes developed further by stitching into the print, and for this I use Japanese paper which is incredibly delicate yet also very strong. The surface of the paper is beautiful and tactile in itself, and it creates a different kind of relationship with the image when you are working into it with a needle and thread. The thread is always the same colour as the ink, as if the drawn line is extending from the paper. 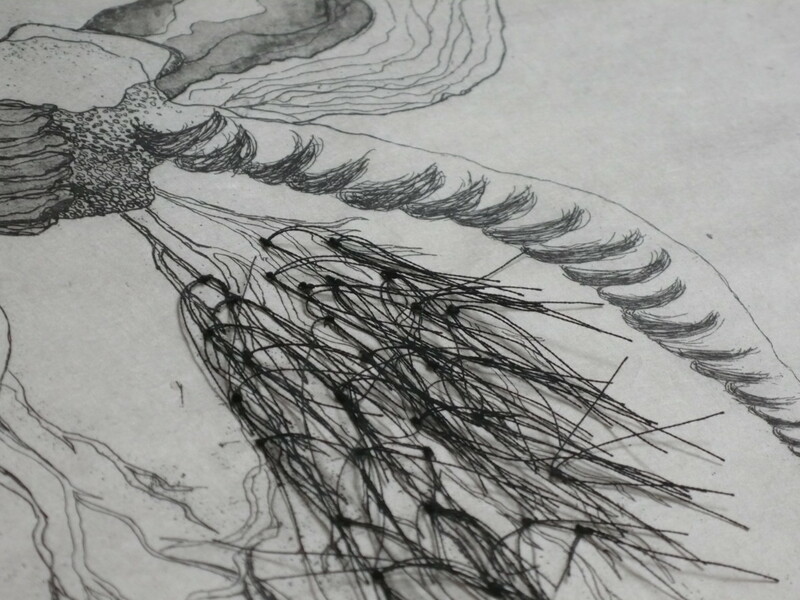 Stitching into the prints, brings with it associations relating to the skin and different kinds of tissue. They relate to issues around gender and femininity and make reference to artists such as Louise Bourgeois, Kiki Smith and Meret Oppenheim. 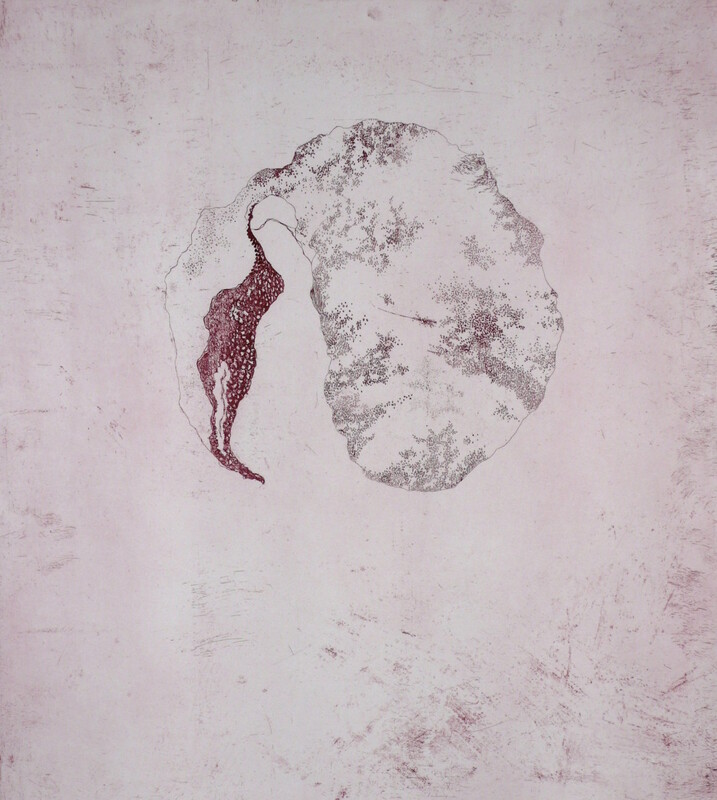 In the print Sepal, the image alludes to a botanical form, but also to human biological shapes which become more three dimensional with the emerging threads. 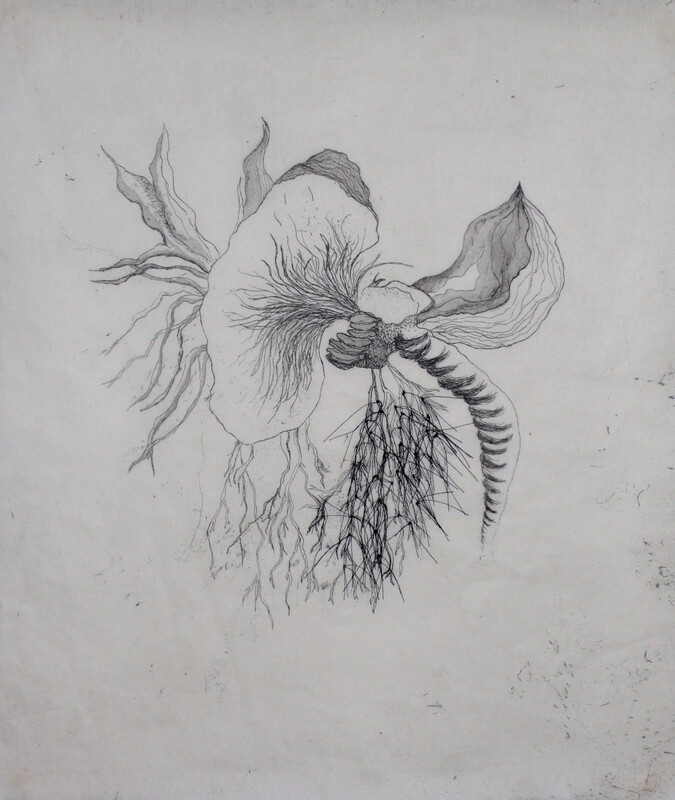 My prints are inspired by detailed drawing studies of plants, flowers, insects and other biological forms. Usually I draw directly from observation but I also find inspiration from other sources such as flower and plant encyclopaedias as well as illustrations from medical books. These different drawn elements are then morphed together to create a novel object that is suggestive of bodily and organic forms, but has a life of its own such as in the print Ovular. The drawn elements in my work have with time become more defined, but its important to me that they are still suggestive and ambiguous in their form, leaving it open to the viewer to make their own associations. To place emphasis on the drawn lines of the prints they are shown against the depth of a single colour background. Choosing the different colours is often a long process of trying different colour combinations, and it can take some time for me to make the final decisions. I enjoy how different colours create different meanings and associations, as in the series Aerola. 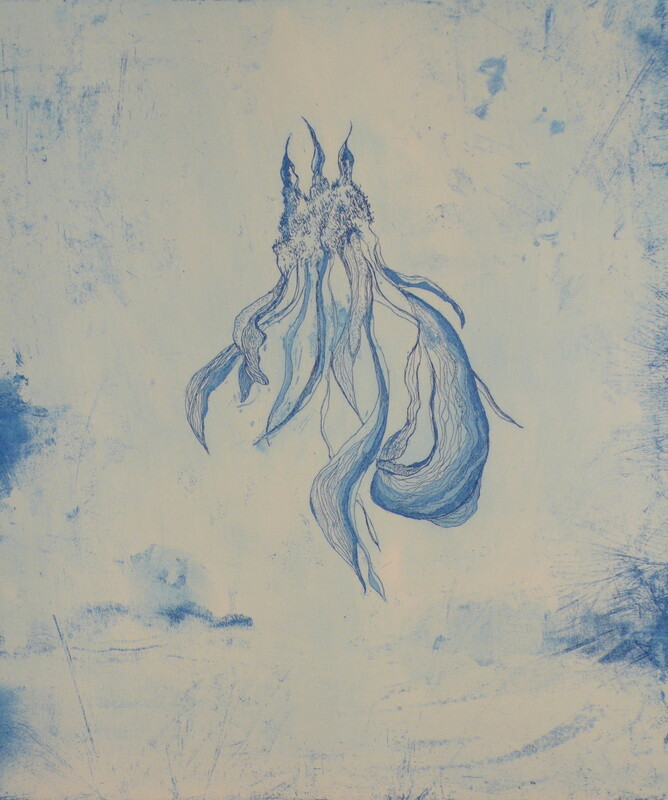 By printing the same etching plate in different colours and creating a series, the idea of the multiple prints are explored. I am currently preparing for an exhibition in Copenhagen, and looking forward to the opportunity to show some new work. Following this, ArtDog will be showing my work at the Affordable Art Fair in Hampstead in June.